INAGUA: Which is the name of a very lonely and nearly forgotten island – By Gilbert C. Klingel: Illustrated from photographs taken by the author: Dodd, Mead &. Co., New York: $3. The technical accounts of ‘Mr. Klingel’s sojourns on Inagua have been published in the “American Museum Novitiates” and in the bulletins of the Natural History Society of Maryland, and portions of certain chapters have appeared in the Baltimore Sunday Sun, and in the Natural History Magazine. 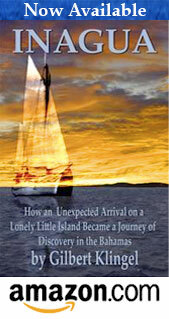 But the book will come as something completely new and completely fascinating to a host of readers who are fortunate enough to come upon Mr. Klingel’s account of his experiences in this strange, lonely spot, and of the wonders he found in Inagua’s huge inland lake, in its surrounding waters, and on its surface. Even in this day of super-expert photography, Mr. Klingel’s photographs are marvels, and the book altogether sets the author at once in the front rank of the imaginative recording naturalists. “Inagua” is a book which, while in no sense a juvenile, should be found of thrilling interest by intelligent older boys and girls, and from then on, to readers of the utmost limit of age.